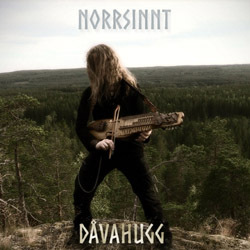 Swedish folk metal project Norrsinnt has released on November 3, 2017 its first full-length album “Dåvahugg“, or better its first “official” compilation of songs. Norrsinnt is a solo project by Enslig (Mathias Gyllengahm, also in Utmarken) and was started in 2014. It draws its inspiration in the local environment, nature, folklore and esoteric traditions, and is realized through works of music, video, graphics and lyrics. Main musical components are metal and Scandinavian folk music, with Nyckelharpa being a key instrument in the compositions. “Dåvahugg” is an album of remixed versions of various tracks that were already released during a period ranging from 2014 and forward. It was never meant to be a complete album and many of the tracks can be seen as experiments. The songs were recorded on different equipment, making the process of mixing them and bundling them together to a unity complicated. It is however a reflection of the period of the creation. The material is generally slow paced, passes through genres like folk metal and atmospheric black metal/doom, and generally has an epic and introspective feeling. A few of the tracks are fully instrumental. “Dåvahugg” is a digital release, available in Norrsinnt’s official Bandcamp page.